Ah... lunch. Lisa and I had lunch in my van on the third floor of the parking garage, where we also dumped out all the various bits and bobs that had accumulated in our bags since the morning. We opened our Heroclix boxes and chatted with hubby-Eric on the phone for a bit. And then, well-rested, we headed back down to the con. Before going in, Lisa hit the cash machine for some spending money. Entering the hall again after lunch I was struck with just how warm the hall was. I normally don't mind warm, but with all the walking the poor fans had to do, the hall was just a tad too warm for comfort. After the walk from the parking garage back to the hall, the heat was not welcome at all. We went back to talk with Kirk Jarvinen again, who had finished the Aquaman piece he was working on for me. It's gorgeous. While we were chatting, P'la stopped by and suggested I hit The Comics Fairplay booth and see my fellow blogger Heidi Meeley. I hadn't realized that a blogger had a booth, so off we went! I chatted with Heidi for a bit, and trolled her, and then Lisa and I wandered off again. We next stopped at the Image booth again, and met Mike Bullock, the writer of Lions, Tigers and Bears, which I bought as it was coming out. We talked a bit, I got him to pose for a trollograph, and we wandered off. Next up we headed back to the Mercury Studios booth, and chatted with Paul Guinan. Lisa bought a book with Boilerplate in it, and I trolled Paul. I was now very tired, and my feet hurt, and I wanted to rest. At that point, we were wandering past the Illusive Arts booth, and when I mentioned how exhausted I was, Anna suggested I sit in their booth for a spell and relax. I was grateful for the chance to get off my feet, and so we settled down in the booth. Lisa flipped through the book she'd bought from Paul Guinan, and I quickly wrote down the names of everyone I'd taken photos of so I wouldn't forget. Greg offered to do a sketch for Lisa, and she gratefully accepted (Batman). Then I started watching folks go by, and when I heard Anna mention that the buttons were free, I started to call out to people and ask if they wanted a free button. Now, I've done booth sitting before. In fact, it's not a job I mind at all in smallish doses. I love talking to people, and it's always useful when the thing I'm trying to show off is something I really believe in. In the case of Dorothy, it's a book I really love, so attracting attention to it is just a natural thing to do. I suspect people who've got more experience at this have better things to say about it than me, but here's the trick. If you have a booth, you MUST have something free to give away. Preferably something small and cool, like a button or stickers. This is the bait. When you ask people if they want something free, 99% of the women and maybe 75% of the men will come over and check it out. People like "free". They've just spent hours tromping around the floor of the con spending money, free is good. And once you have them at the table, you politely and quickly give them an overview of whatever it is you are selling. My speech for Dorothy was simple: "Have you heard of Dorothy? No? Well, it's a modern retelling of The Wizard of Oz, only Dorothy is a teenager with a chip on her shoulder. Would you like to take a look?" And that was the second thing the Illusive team did right. They had sample books set out to flip through. So after my speech, most people would politely flip through the book. At which point, if they still seem interested, you can hit them with the rest of the information. If they aren't interested, wish them a happy con and let 'em go. You might have planted a seed for the future, or they might completely forget about the book. But you've done your job. I don't know if I sold any books while in the booth, but I had a great time and chatted with a lot of people. In the meantime, Lisa got a sketch and Greg offered to do a second sketch for me, as well. I also gratefully accepted, and it actually kept me in the booth a bit longer, so I was well rested when Lisa and I decided to hit the floor and troll for more pictures. We revisited Paul Guinan first, where Lisa asked for a sketch of Boilerplate. I wandered over to Brom and got a trollograph. 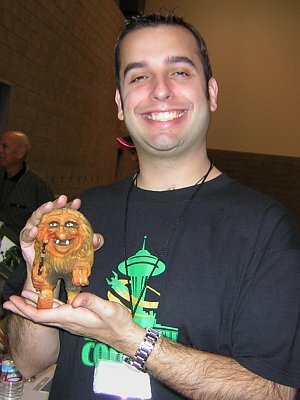 I then spotted Jim Demonakos and got his trollograph, too. Lisa was amused. A note about the shirts... Con "officials" were wearing black shirts, and con support staff were wearing green shirts with the word "LACKEY" on the back. The designs stood out, and you could always tell who to call for help. The costume contest was about to start, so Lisa and I headed up to check it out. This convention is new enough that programming is still weak, but Jim has been doing an excellent job of growing the con slowly and not pushing too hard. I think the con will have better programming each year, until it rivals the best cons out there. 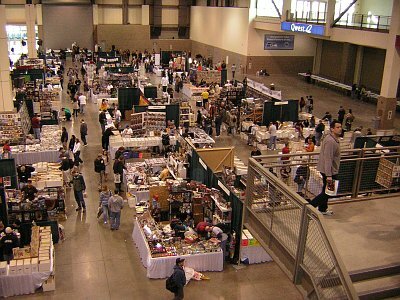 I already think the con floor is better than a great many. In any case, the climb to the costume contest was hard on my knees after a day of walking on the concrete floors, and the area was sitting room only. I took a few pictures, but something about the lighting up on the balcony made the images come out looking horrible. I like my camera, but I didn't get any shots I consider worth sharing. Some costumes of note... there was a young man, who came up about to the waist of any adult, who was dressed in a homemade Boba Fett costume. 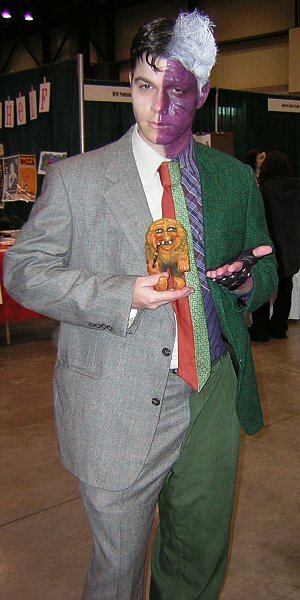 It was clear that he'd made the suit himself, and where it lacked in polish it made up for in enthusiasm. I also saw Kid Flash, Speedy, Aqualad (yes, the one I took a picture of), numerous Jedis, a Ghostbuster, Poison Ivy, and the most amazing Two-Face I've ever seen. We didn't stay at the costume contest for long. The balcony really bothered me (it had a slight but disturbing motion to it) and without a place to sit, I wasn't willing to hang around. 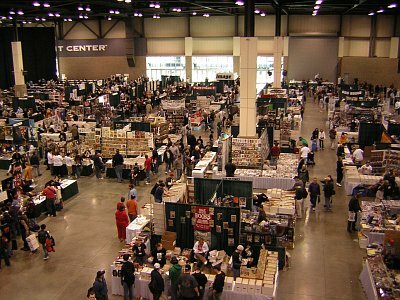 I did take the overview shots of the con floor from the balcony while we were up there, though. 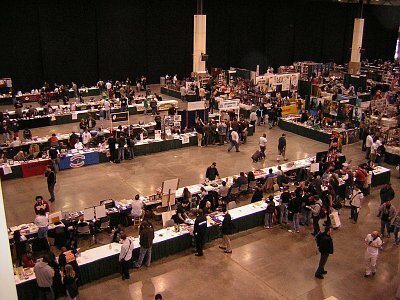 First up, Artist Alley. The curtain divided the Event Center into two sections. The other section was occupied this year with a different event. I never did quite figure out what was going on over there, though I'm sure if I looked hard enough I'd find out easily. Next up, the Main Floor. Because we didn't linger at the costume contest, we wandered the floor some more. I was getting tired, so the camera didn't come out as quickly. We wandered down an aisle I hadn't hit yet, and ran into Mark Brill. He and Lisa started talking, while I chatted with his boothmate, and then Lisa asked for a sketch. Mark drew Platypus Rex for her. In the meantime, I wander across the aisle and met Scott Mills, who I've bought books on-line from in the past. We chatted, I trollographed him, and then I showed off my sketchbook. It became one of those rare moments, when the artist is inspired by all the other sketches to add to the book. I got a Scott Mills original, which I will be posting to this blog at a later time. Lisa and I retreated back to the Illusive booth for a bit of a rest, when somebody noticed Two-Face walking by. I had to troll him! 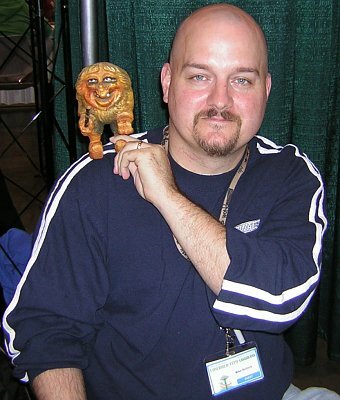 I dashed around the corner and asked to take his picture with the troll. He was delighted to pose for me. I don't know if the photo does the costume justice. It was the most amazing costume, from the clothes to the make-up. That was it for both of us as far as photos and sketches. We did a little more wandering, and ended up back at Kirk Jarvinen, where P'la told us about the cell phone drive she was heading. If we had any old cell phones we wanted to get rid of, this was the place. To my surprise, Lisa recalled that she and mom each had an old phone. I also had a phone to get rid of, so I would be able to bring three phones on Sunday... assuming we could find them all. Lisa and I were both worn out, and there was only an hour or so left in the con, so we stopped by and said good-bye to Greg and Anna, and made our way back up to the parking garage. We sorted out our stuff and I agreed to follow Lisa home to pick up the used cell phones for P'la's drive. When we got to my Mom's house, Lisa found her phone immediately... but Mom wasn't having any luck. She'd been cleaning and had held the phone in her hand earlier in the day, but it had vanished in the meantime. If only we had called a bit earlier! I stuck around awhile, helping with the search, but eventually had to go. I told Lisa that I was going to organize the stuff in my van before I left, so I'd be sitting outside for a bit longer if they kept looking. After I'd delayed as long as was reasonable, I put my glasses on, put the key in the ignition, and started to turn it... and Lisa came running out. They'd found it! In a basket that all three of us had already looked in! Apparently it vanished until it thought I was gone. I took the phones and headed home. When I got home, I was scheduled to make dinner but was too tired. Eric, being a complete sweety, ordered in pizza. After a quick meal, we both relaxed... except we couldn't find Eric's sketchbook. I'm going to start scanning his sketchbook at some point, because he has the most awesome pieces in it. But Saturday night, we just couldn't find the sketchbook at all. I had a blank sketchbook, and I planned to take that along if it didn't turn up. I went to bed slightly disturbed at the missing sketchbook, but delighted with the fun I'd had on April Fool's Day.